(a) Check the brake pedal height. (1) Turn back the carpet. (2) Measure the brake pedal height from the dash panel to the bottom edge of the brake pedal pad. 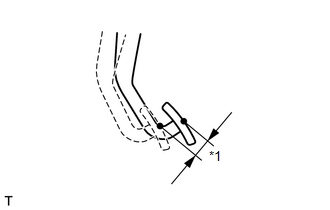 If pedal height is incorrect, adjust the push rod length according to procedure below. (b) Adjust the push rod length. (1) Remove the stop light switch assembly (See page ). (2) Remove the brake booster assembly (See page ). 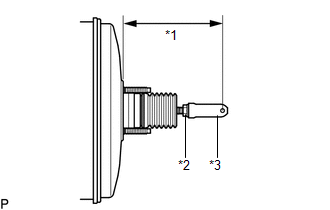 (3) Loosen the lock nut and adjust the push rod length*1 shown in the illustration by turning the brake master cylinder push rod clevis to achieve the length*1. (4) Tighten the lock nut. (5) Install the brake booster assembly (See page ). If the pedal height is incorrect even if the push rod length is adjusted, check that there is no damage to the brake pedal support assembly and dash panel. Even if there is damage, there is no problem if the reserve distance is within the standard value. 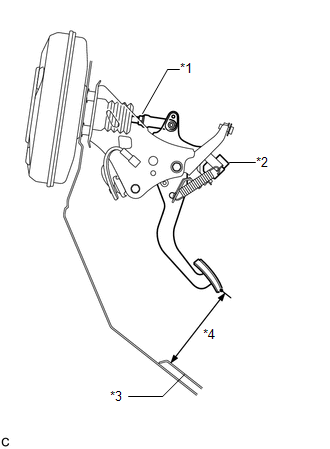 If necessary, replace the brake pedal support assembly. (6) Install the stop light switch assembly (See page ). (7) Check that the stop lights do not come on when the brake pedal is released. (c) After adjusting the pedal height, check the brake pedal free play. (a) Stop the engine and firmly depress the brake pedal several times until no vacuum is left in the booster. (b) Measure the free play of the brake pedal. play is as specified, proceed to the Inspect Brake Pedal Reserve Distance procedure. Measure the distance at the same point used for the brake pedal height inspection. (b) Depress the brake pedal and check the pedal reserve distance. (1) Depress the brake pedal with a force of 500 N (51 kgf, 112.4 lbf). (2) Measure the distance between the brake pedal and dash panel. If the distance is not as specified, troubleshoot the brake system (See page ).